A national treasure in his native Curaçao, singer-songwriter Oswin Chin Behilia has had a musical career that stretches back to 1963, when he formed Los Tiarucos, a popular touring band. 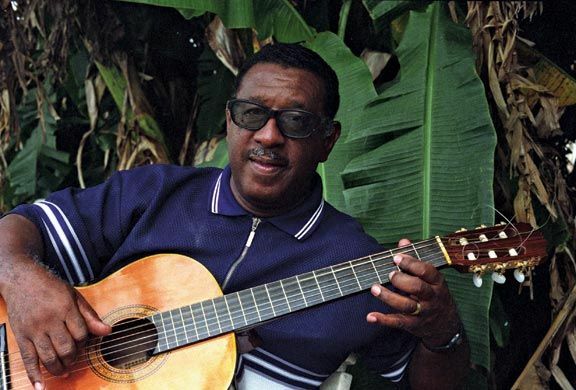 His song “Plegaria” is considered an alternative national anthem in Curaçao, and his ballad “Sunú” is one of the most popular recordings ever made in Papiamento, the hybrid language of the Dutch Caribbean. He is also a longstanding television talk-show host who briefly served in public office, and was knighted by Queen Beatrix of Holland for his services to Curaçao’s culture. Now in his early seventies, he has undiminished vocal strength. Chin’s audience was recently widened through a contract with Otrabanda, a Dutch independent label. His latest album, Liber, reflects the polyglot nature of Curaçao’s culture, being comprised of local forms like tumba, the merengue-flavoured local Carnival music, and seú, a folk rhythm linked to Curaçao’s annual harvest festival, though several numbers sound surprisingly Latin American, thanks to the influence of nearby Venezuela, and the lively percussion of Yeye Calderon, who has played with Chin since the Tiarucos days. Though there are topical songs of romance and domestic affairs, Chin’s trump cards are his politically oriented protest numbers, which are somehow also the most danceable: “Zikinza” warns that the island’s beaches will soon be off-limits to locals, “Ata Toni” speaks of oil money heading overseas, and “Sigi Traha E Bom” rails against the recent dissolution of the Federation of the Netherlands Antilles. Enhancing the package is a beautiful booklet, with lyrics in both Papiamento and English. Say what you like about controversial soca star Machel Montano, no one could ever call him inconsistent. The title of his latest release is proof enough of this. Releasing 34 albums is a major achievement, even for someone whose career started at the age of eight. While Montano was missing in action at Trinidad’s Carnival earlier this year, it was music from this album that kept his heartbroken fans company. In what could easily be his most musical disc yet, the songs on this set are party-ready with a delicious concoction of Caribbean music. Even Montano’s vocals, which over the last few years had taken on a strained sound, seem sweeter and more controlled. You can hear this best on “Thiefin”. On the infectious track “Awite (Ramajay)” you hear cadence, zouk and soca. “Wooeeii Gyal Wooeeii”, which pairs the singer with Jamaica’s Busy Signal, has African leanings, while “Hot Like”, which features Serani, has dancehall inflections. Listen for the muy caliente remix of “Awite”, featuring Pitbull, with its Latin dance flavour, and the groovy “Bumper to Fender”. 34 is much more than just another Machel Montano release. It represents his musical growth as an artist and the direction he is taking the music in. Reggae gospel is on the rise as the most palatable way of getting young believers to listen to the genre. Surprisingly, it is all happening in the land of soca, Trinidad & Tobago. It was perhaps with that knowledge that singer Sword released this full, unadulterated reggae album. A music minister whose real name is Nigel Da Costa, Sword offers a solid disc that addresses perilous times, evil and the second coming of the Christ. He is a soldier at war on this disc, his voice strong and bold with conviction. Bass players Richard Craigwell, John Mark, Steven Ali and Orville Roach seem to be working overtime with their throbbing fretwork. The background vocalists, led by Sword’s wife Giselle, and featuring Kiselle Francis, Kaysha Gonzales, Karen Vincent and Ginel Edwards, are also on point, their voices blending in sweet harmony. It helps too that the quality of the recording is also crisp, a relief for any listener who prefers to have this disc piped through their headphones. “Don’t Give Up” (with the catchy refrain, “If you thinking to do something foolish”, which Sword repeats for effect), “Jah Is on My Side”, “Hotta”, “Blessing” and “Sword” are the songs that listeners will bond with first. Tag Rebel as a CD that’s worth a listen.